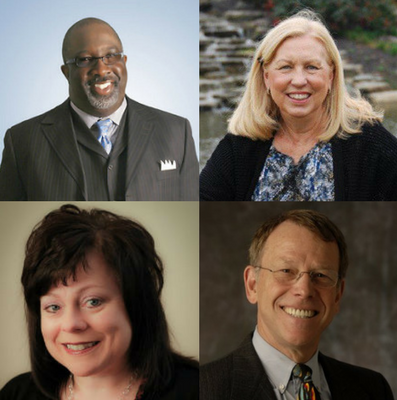 Anderson University will honor distinguished alumni and friends on campus when it celebrates its 100th commencement on Saturday, May 5. Bishop Timothy J. Clarke will serve as the commencement speaker and will receive an honorary doctorate of divinity. Bishop Clarke is the senior pastor of First Church of God in Columbus, Ohio. Clarke has served in several leadership capacities with the National Association of the Church of God, on the boards of various community and political organizations, and is the author of seven books. He will also assume the role of chairman of the General Assembly on July 1. Rev. Dr. Melissa Pratt (BA ’91) will serve as the baccalaureate speaker. She has been the senior pastor of the Teays Valley Church of God in Scott Depot, West Virginia, since February 2007. In addition to her pastoral work, Pratt is a conference and retreat speaker, preacher, author, and worship evangelist. Dr. Todd R. Clear (BA ’71) currently serves on faculty with the School of Criminal Justice at Rutgers University—Newark after previously serving as provost and interim chancellor. Clear has won several awards and served in multiple leadership roles in the field of criminal justice, and has authored or co-authored twelve books. Margaret A. Lewis is the founder and president of Village Project Africa. She previously served as associate director of Tri-S at Anderson University. Her travels have taken her to more than sixty countries around the globe leading tour groups, volunteering at work camps, and visiting mission fields. Pratt will speak during the baccalaureate service at 10 AM in Reardon Auditorium on May 5. Bishop Clarke will speak and the honorary degrees will be awarded during commencement activities at 3 PM in Kardatzke Wellness Center. For more details and a full schedule, visit anderson.edu/commencement. Anderson University is a private, liberal arts institution in Anderson, Indiana with a mission to educate students for lives of faith and service in the church and society. Anderson University is recognized among top colleges by U.S. News and World Report, Colleges of Distinction, and The Princeton Review. Established in 1917 by the Church of God, the university now offers more than 50 undergraduate majors and graduate programs in business, music education, and theology. Please contact news@anderson.edu with any media requests. This entry was posted in All Church of God, Colleges & Universities and tagged Anderson University, AU, Award, commencement, graduation, honor, honorees, Margaret Lewis, Melissa Pratt, Timothy Clarke, Todd Clear. Bookmark the permalink.